“The Hate U Give," based upon the book by Angie Thomas, is a documentary of our time. The movie beautifully and powerfully showcases the condition of Black people in contemporary times, and the strife and heartache involved in cases of police brutality. The movie is a must watch emotional roller coaster that will leave viewers clinging to every moment. 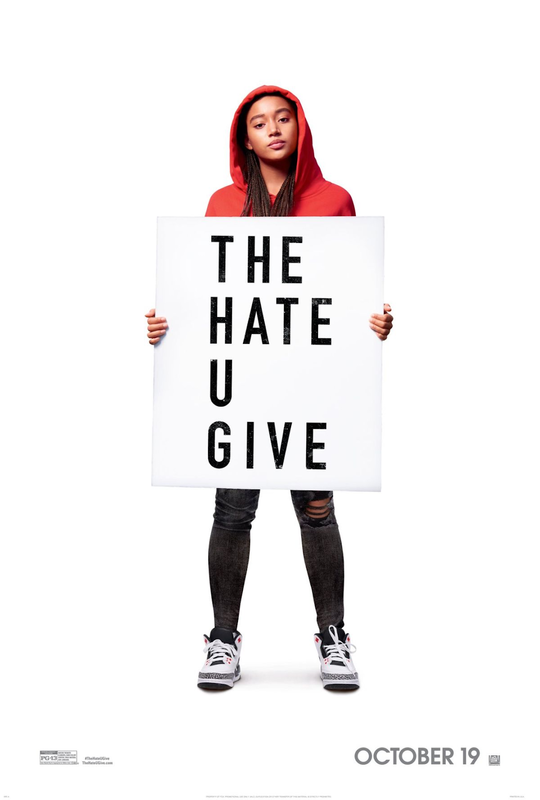 "The Hate U Give," based upon the book by Angie Thomas premiered in theaters October 19th. Photo courtesy of IMDb. The story explores multiple different issues at the forefront of Black people’s minds. The movie follows the life of Starr Carter (Amandla Stenberg), a young Black girl from Garden Heights, a poor Black neighborhood in Georgia, as she tries to find her voice after witnessing a police officer shoot her best friend at a traffic stop. Starr's lifelong friend, Khalil Harris (Algee Smith), is driving them home from a party when the officer pulls them over for “not using a turn signal.” After Khalil questions the officer, he is instructed to get out of the car and put his hands up. When Khalil grabs his hair brush, the officer shoots him. Though this movie centers around the death of Khalil and its aftermath, the movie is also the story of Starr. Starr starts off as a girl struggling with living two lives, one as a girl from Garden Heights, and the other as a Black girl at Wilson, an elite, predominately white private school. Starr works hard to separate the two: she doesn't let the Garden Heights people see the Wilson side and doesn't let the Wilson people see the Garden Heights side. When her friend is shot, these two words collide. Starr is confronted with shedding her second identity at Wilson to make a stand for Khalil. In the process, she takes a stand for herself and who she truly is. Starr is played by Amandla Stenberg, best known for her role as Rue in “The Hunger Games.” Stenberg powerfully plays the role of Starr and makes the audience see her transformation. At the beginning of the movie, Starr is timid and afraid to speak up about the shooting of Khalil and wants to remain anonymous. But by the end, with the support of her friends and family, she learns to speak up for herself and leading the fight for justice. Character development is not a phenomenon exclusive to Starr. None of the characters are stagnant. It is refreshing to see Black people as fully thought-out characters who develop throughout the movie. Even the smaller characters like Starr’s younger brother, Sekani (TJ Wright), who hardens and learns how dangerous it can be to be black throughout the film. There are some cringe worthy moments throughout the film. The white students at Wilson try to mimic Black people, and Starr’s white boyfriend is obsessed with sneaker culture and makes beats. Though these moments are somewhat corny they are important because they show how everyone at Starr's school "acts black" yet, one of the only black people can't because she'll be looked down upon. Despite these moments, the story is honest, and given the current political climate, it is relatable for Black people and minorities who have been targets of systematic racism. Starr testifies in front of the grand jury, but they fail to indict the officer who shot Kahlil, sparking a massive protest much like scenes in Ferguson and Baltimore. This is a movie about an unarmed black child being shot, and it doesn't shy away from the underlying issue of institutionalized racism. Similar to many cases of police brutality, the media focuses on the side of Khalil where he was selling drugs. However, the movie doesn't make the characters one-sided. “The Hate U Give”, has multifaceted characters, a riveting plot and poignant social commentary, all making it a compelling film to watch. It isn't an easy or fun movie to watch, but it is a story that demands to be watched. More than that, this is a story that deserves to be heard.